PPL Home>Rv-Parts-Rv-Accessories>Maintenance & Hardware>Cleaners>Fiberglass Cleaners & Color Restorers>Oxidation Remover 32 Oz. 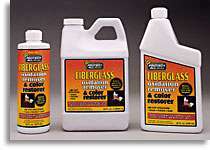 Fiberglass Restorers - Restores shine to dull RV fiber glass and aluminum. and more with Protect All FIBERGLASS Oxidation Remover & Color Restorer. enamel and polyurethane painted aluminum. Cleans, polishes and seals all in one easy step. ultra-violet rays. In order to restore and retain a lasting, high gloss shine, it is necessary to remove the oxidation to expose a clean layer of fiberglass or paint. If oxidized fiberglass or paint is left untreated for long periods, the surface may permanently fade, requiring professional preparation or repainting. polish and wax formulated specifically to remove light to medium oxidation and restore color, shine and luster to RVs, cars, trucks and boats. oxidation removed is usually the color of the fiberglass or paint.) Allow to dry and polish with a soft cloth to a brilliant shine. For use with a buffer, apply product to small section and buff with an orbital or hi-speed buffer to a high gloss shine. Allow to dry and polish with a clean soft cloth.